George Washington, Old Line and Worsell Manor. Timber framed home in Baltimore County, MD. This was a project we did a number of years ago for some clients in Baltimore County, MD. Wey Timber Frames was responsible for the timber frame only. The designer did a great job of planning out the spaces and he was very creative with the timber frame layout as well. The frame is mixed oak harvested in Pennsylvania and sawn locally. 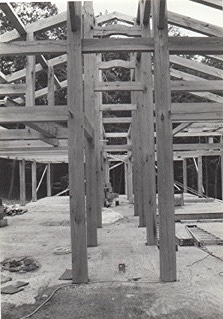 It remains as one of the more interesting frames that we have completed; it took two full tractor trailer loads of timber to supply all timbers that we needed. The owners chose some very cool finishes in addition to the timber frame. The finishes and features included: Cedar, exposed aggregate concrete, linseed oil based floor coverings, cork flooring, wide (up to 18”) random width hardwood flooring, mica lighting, a custom handmade entrance door with sidelights, Structural Insulated Panels on the walls and roof and a river rock fireplace and chimney are just some of the choices. We also provided some of the other carpentry throughout the house which gave us the opportunity to acquire some antique planks and timbers to fashion the staircase, railings and balusters to the loft area. This was truly a pleasure to be a part of! Raising day in Baltimore county. Oak frame waiting to have some final peg holes drilled before lifting up with the crane. Oak in Black and White.